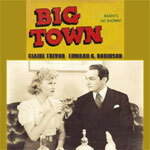 Big Town was a crime drama broadcast from 1937 to 1952. Edward Robinson played Steve Wilson, the managing editor for Illustrated Press. Claire Trevor portrayed Lorelei Kilbourne, a society editor and sidekick in Wilson's adventures in search of stories. During its 15-year run on radio, Big Town was popular and considered the best known reporter drama. The plots of Big Town deal with crimes involving drunk driving, drug rings, murders, hate crimes, and juvenile delinquency. Each episode opens with a memorable line, "Freedom of the press is a flaming sword! Use it justly . . . hold it high . . . guard it well."